A Bulgarian football legend wants to bash the bruised and battered Brazilians back into shape. Hristo Stoichkov is among the candidates vying for the Mamelodi Sundowns coaching vacancy. About 30 applicants hope to get the nod from hard-to-please billionaire club president Patrice Motsepe. Sundowns severed ties with fiery French head coach Henri Michel this month. Stoichkov was the star of Bulgaria's incredible 1994 World Cup campaign in the US, where his six goals made him the tournament's joint top scorer with Oleg Salenko of Russia. His exploits earned him the accolade of Europe's top footballer in that year. He scored 37 goals in 83 appearances for his country, which he went on to coach between 2004 and 2007. Trott Moloto, who heads the committee hunting for the new Downs coach, confirmed to the Sunday Times that Stoichkov was among those in line to replace Michel, the journeyman who this week was appointed coach of Algeria 's national team. "But we have not started discussing anybody," says Moloto. "We have been receiving a lot of applications. There are a couple of names from South America. Some I have never heard about." The Sunday Times understands that the Sundowns board met yesterday to start the process of sifting through the applications. Stoichkov was the backbone of the brilliant Bulgarians in 19 94, scoring some superb goals in famous victories against 1990 finalists Argentina, Greece, Mexico and defending champions Germany before succumbing to Italy in the semifinals. The diminutive striker, one of soccer' s best left-footed players, produced more dazzling displays for FC Barcelona. Leading the line alongside Brazilian sharpshooter Romario, Stoichkov masterminded Johan Cruyff's side to four successive La Liga championships and delivered the Champions League crown. "There are only two Christs; one plays for Barcelona, the other is in heaven," he was quoted as saying during his heyday at Barcelona, alluding to his first name Hristo, which is Bulgarian for Christ. But Stoichkov, who spent six months on the stands during his time in Spain - for stomping on a referee who sent him off - did not enjoy similar success when he swa pped his playing kit for a coaching tracksuit. 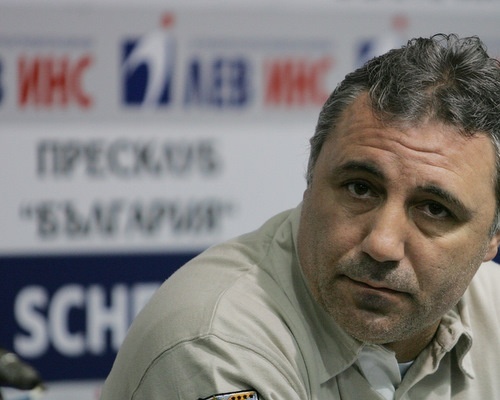 Known as the Maradona of Bulgaria, where he starred for CSKA Sofia, Stoichkov resigned as national coach after they failed to qualify for the 2006 World Cup. Former coaches Neil Tovey and Gordon Igesund have also been linked with a return to Chloorkop. But one insider dismissed this as "a figment of someone 's imagination, those two are completely out of the running". Meanwhile, in the Mother City, Ajax Cape Town coach Craig Rosslee has allegedly been given an ultimatum to win the Nedbank Cup, or else. After finishing second and missing out on the league title on the last day of the previous season, Ajax's priority this season was to win the league. But the wheels came off spectacularly following an impressive start and Miguel Gamondi has been linked with a trek down to the coast as a replacement for Rosslee. Ajax PRO Thabiso "Shooz" Mekuto says Rosslee is not facing an ultimatum, but a challenge to win a second trophy and make this a successful season. "The expectation was to win the league after a great performance last season," says Mekuto. "We dropped considerably on the log so winning the Nedbank Cup will mean we have had a successful campaign by winning two trophies, something no other club has achieved this season. "So, the coach knows that he has to win the Nedbank Cup. The CEO of the club will have to look at how he deems success and failure when comparing last season and this one." Finishing eighth, adds Mekuto, will mean Ajax have failed this year, "but we do not make emotional decisions. The technical team, the director and all stakeholders will make changes according to the needs of the team before making a holistic technical decision." Mekuto has heard "hints" that Platinum Stars approached Rosslee, but says Ajax are confident that they will keep him next season. At struggling Kaizer Chiefs, it has emerged that Muhsin Ertugral is already packing his bags and will not be the head coach next season. The players have failed to respond positively to Ertugral's technique in the two seasons he has been with the Amakhosi.